#ThatBusinessShow welcomed Sandee Devine to the show this morning at the top of the hour. Sandee is Vice President of Franchise Development with Murphy Business and Financial and has over 25 years of experience in the franchising business. She assists both buyers and sellers in the franchise business and has a wide array of experience and knowledge including contract law, litigation management and trademarks. As Vice President of Franchise Development Sandee is responsible for franchise compliance, franchise marketing and awarding new franchises and has worked for several national franchise chains. Sandee speaks of the advantages of using a broker when searching for a franchise opportunity in this opening segment and given her experience as well as the reputation of Murphy Business and Financial, who was highlighted as one of only 6 low-cost franchises that generates over $100,000 annually in Franchise Business Review’s Top Low-Cost Franchise Report, she is an excellent source to help you buy or sell a franchise. With over 300 concepts in the Murphy Business portfolio across various industry, be sure to learn more at http://www.murphybusiness.com and reach out to Sandee at 727-725-7090 or s.devine@murphybusiness.com for more information! 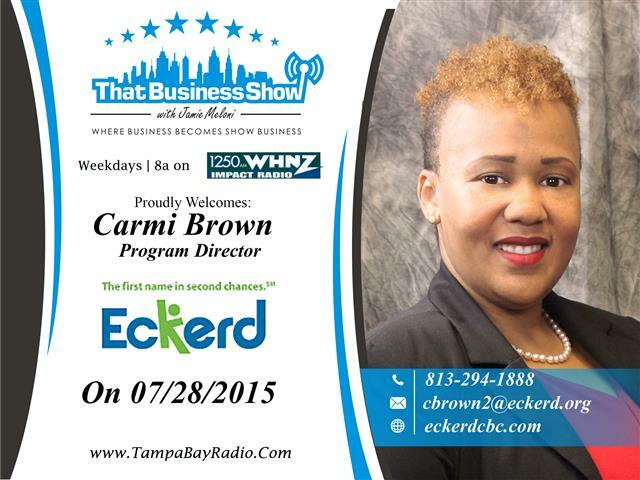 On the 2nd half of the show, Carmi Brown, Program Director for Friends of the Children with Eckerd, joined the program. This program is working as a partnership with Eckerd to provide children affected by disadvantages in life to have the same opportunities as other children and to achieve their dreams too. Through the use of “friends” or mentors, children are guided through childhood starting at age 5 or 6 all the way through High School. The mentors spend 16 hours a week with the child working with them on a variety of activities designed to keep their minds enriched and steering them out of trouble. The primary goals of the program are to see that all participants receive a High School diploma, stay out of the juvenile justice system and avoid becoming a parent too early. The program has over 22 years of experience and has seen a number of children all the way through the program. Carmi speaks of some of the activities and programs the children experience on this segment and also encourages local business leaders to reach out to assist in the program as they always need funding and sponsors. To learn more, visit http://www.eckerd.org and Carmi can be reached at 813-294-1888 or cbrown2@eckerd.org for more information! As always, be sure to listen live at 8am on 1250WHNZ or catch the show replays On Demand at http://www.tampabayradio.com and available on my YouTube channel as well at https://www.youtube.com/user/jamiemeloni Email Jamie@tampabayradio.com for ways to get involved in the show and we are always looking for partnership and sponsorship opportunities. This entry was posted in Entrepreneurship and Business and tagged branding, business, child welfare, coldwell banker, eckerd, entrepreneur, franchise, franchising. Bookmark the permalink.